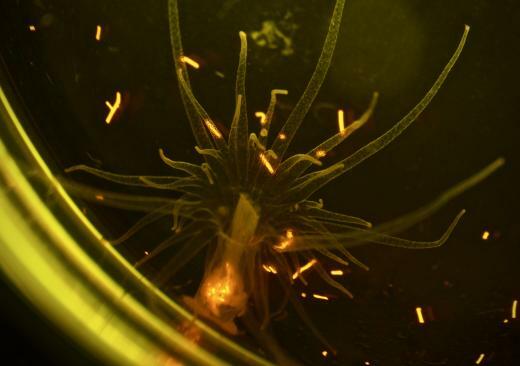 Tiny fragments of plastic in the ocean are consumed by sea anemones along with their food, and bleached anemones retain these microfibers longer than healthy ones, according to new research from Carnegie's Manoela Romano de Orte, Sophie Clowez, and Ken Caldeira. "Plastic pollution is a serious and growing problem for our oceans and the animals that live in them," Romano de Orte said. "We wanted to understand how these long-lived contaminants are affecting fragile coral reef ecosystems. Plastics could be confused by the organisms for food and could also be carriers of other harmful contaminants. Since sea anemones are closely related to corals, we decided to study sea anemones in the laboratory to better understand effects of plastics on corals in the wild." Most laboratory research on plastic pollution uses tiny beads of plastic, not microfibers. So Romano de Orte, Clowez, and Caldeira set out to determine whether microfibers are ingested by healthy sea anemones and by those that have lost the symbiotic algae that provide them with nutrients, a condition called bleaching. On corals reefs, bleaching is caused by increasing ocean temperatures due to global climate change. The research team introduced three different kinds of microfibers--nylon, polyester, and polypropylene--to both unbleached and bleached sea anemones both alone and mixed with brine shrimp.